Julie Rice in an entrepreneur, investor and co-founder of SoulCycle, a New York City-based fitness company that offers indoor cycling (also known as "spinning") workout classes. Rice studied English and theater at Binghamton University. She is married to Spencer Rice. The couple has two daughters. Rice worked as a talent manager in Los Angeles for twenty years, then moved back to New York in 2002. 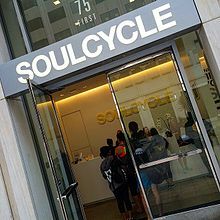 Rice founded SoulCycle in 2006 with Elizabeth Cutler and Ruth Zukerman. SoulCycle's first studio was on the Upper West Side. The three were self-funded, a large amount of the money coming from Cutler’s investment in Izze Beverage Company. Rice sold most of her SoulCycle shares to Equinox Fitness in 2011. She sold the remainder of her shares to Equinox in 2016 for approximately $90 million. She remains on the board. Rice was named Chief Brand Officer of WeWork in November 2017. ^ a b Li, Shan (August 9, 2015). "SoulCycle founders are peddling fun in the gym". Los Angeles Times. ^ a b c Romeyn, Kathryn (July 3, 2017). "How an Ex-Talent Manager Co-Founded SoulCycle and Sold for $90M". Hollywood Reporter. ^ Saint Louis, Catherine (2010-10-10). "In New York, a Rivalry Shifts Into High Gear". New York Times. ^ Hong, Nicole (2013-09-18). "How I Built It: Cycling Chain SoulCycle Spins Into Fast Lane". Wall Street Journal. ^ L'Heureux, Catie (November 20, 2017). "SoulCycle Founder Julie Rice Is the New Chief Brand Officer of WeWork". The Cut. This page was last edited on 3 March 2019, at 04:50 (UTC).